I post some of my work on Facebook groups and Reddit but I like the idea of having it all cataloged here and am looking forward to feedback from the community. I am a narrative driven hobbyist/gamer and I want the lore to drive my army, not the rules or what's hot. There is a story in the lore about the world of Baran. Long story short is a detachment of Raven Guard got wiped out by Eldar trickery. The world is described as a beautiful Eldar Maiden world with oceans, forest, rolling steppe plains, and lush vegetation. I was drawn to the story because the RG got screwed (yet again) and the setting seemed perfect for a narrative driven story. 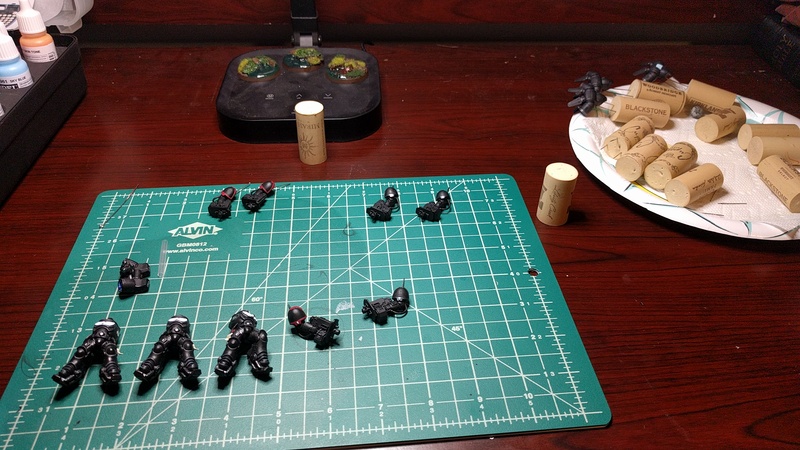 From a modeling perspective the basing needed to match the world would be perfect because it would provide opportunity to help my army stand out since an all black army can get kind of boring. My Raven Guard detachment is on a revenge (Vindicet) and honor (Honorem) mission centered on the world of Baran. Their goal is to attempt to recover a lost relic that the previous detachment had and exact revenge on the Biel Tan Eldar that shamed them roughly 100 years ago. I put some black/red paint down below the head, that way if my idea didn't work I'd still have color on the bottom to poorly imitate what I wanted. I added some Realistic Water to the base and then watered down some of the black red on a brush and gently dipped it into the RW while it was still wet. The paint was thin enough that it sort of just ran off the brush into the RW and did it's thing. 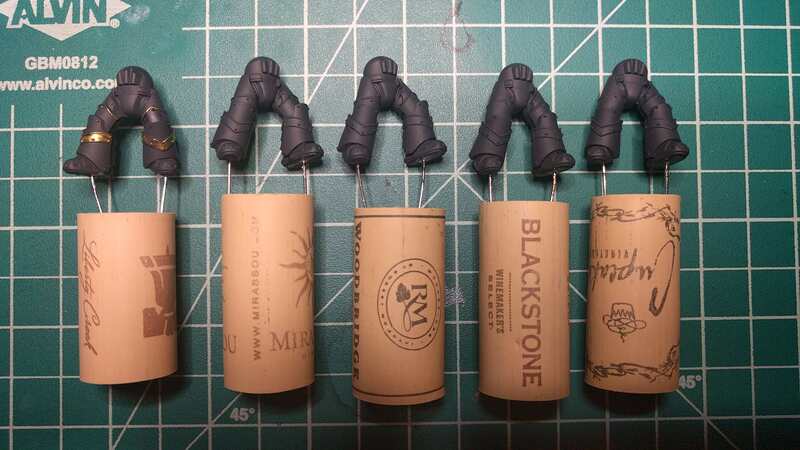 RW usually takes two or three applications because some gets sucked up into the cork so when I applied the others layers I repeated the process making sure to stay closer to the head. Overall I'm really happy with the results and can't wait to get models on them. They are a bit shiny right now, that's partially due to the Secret Weapon Miniature washes being a bit glossy and my light. I'll be hitting them with a matte varnish when I seal the models up and that will tone things down to where I want them to be. Edited by thewarriorhunter, 29 December 2018 - 02:49 AM. 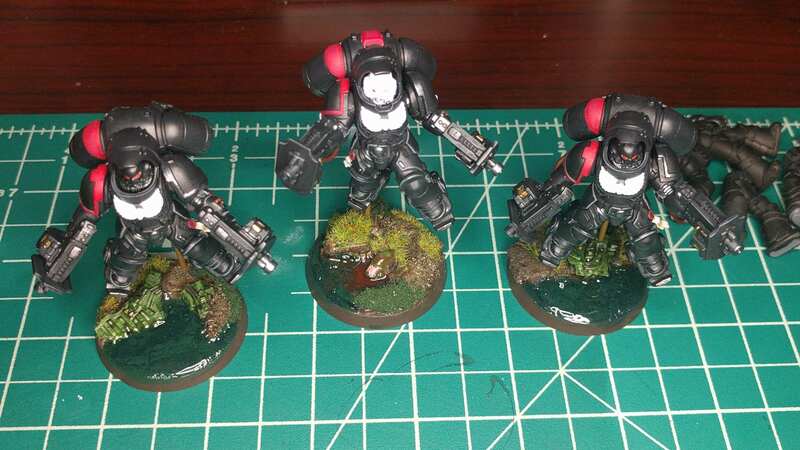 Closer to getting my Inceptors done. Bodies and heads are done. 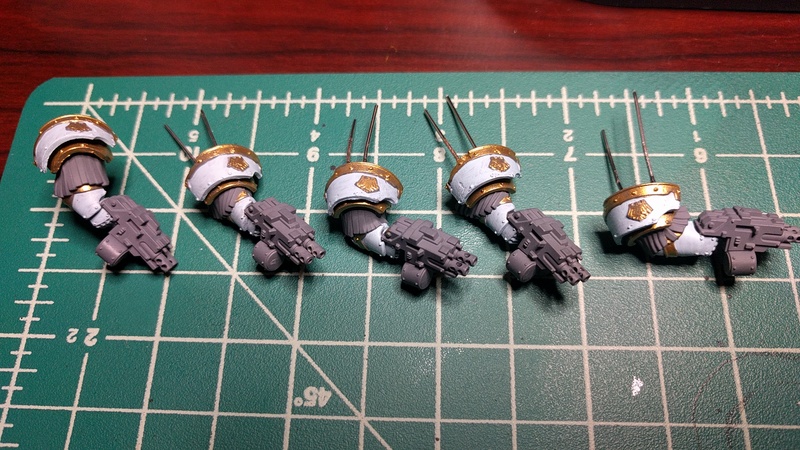 I'm magnetizing the arms because I saw the models with plasma. I have a game Sunday that I want to use these guys in. I may end up magnetizing the arms tomorrow and will use them without being fully painted. The water effect is really nice, I have the GW Water Effects stuff that should do the same (mostly)? 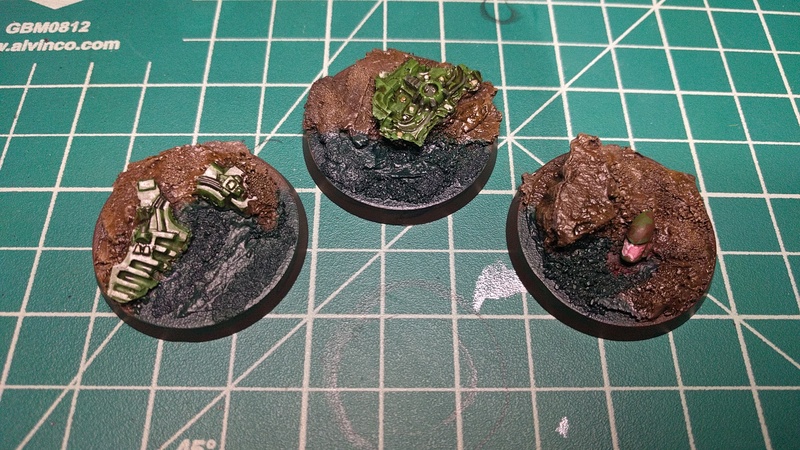 What colour did you base with before applying the water? I've used a brown for a dirtier water but it looks like the blue(ish) colour you have works better. All my painted are Vallejo because I got a stupid good deal on their model color paint case set. I have a few Vallejo model air paints because that's what the local hobby shop has. I mostly use Secret Weapon Miniature washes because I got their whole range when they ran a sale. The black is pretty simple to do as well. I'm a paint-by-numbers guy so I like simple. I mix Vallejo Black with Vallejo Black Grey 50/50 and base coat. 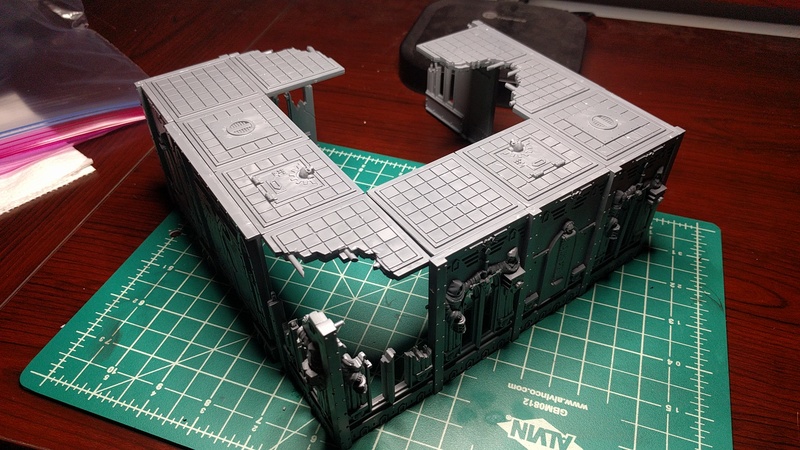 I then apply a wash of Nuln Oil to bring it down. After I apply my highlights and other color details I do a final wash. That brings the steel colors down and also gets me the black you see. Doing it that way give some depth and allows for it to not be an even flat black. 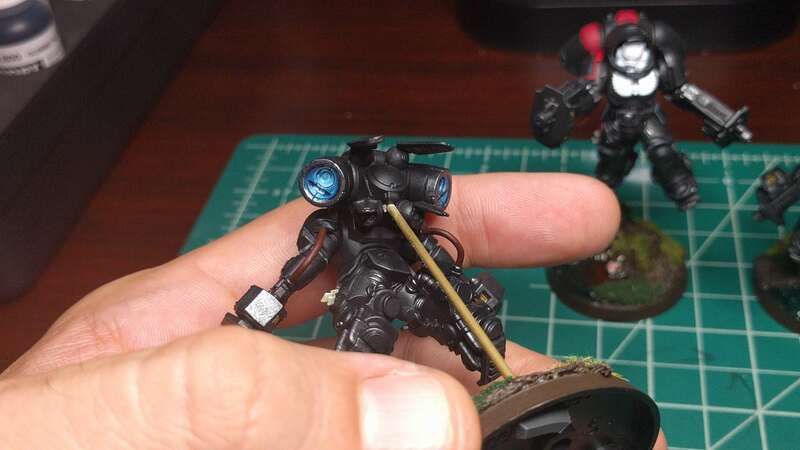 I don't know if I'll ever be able to paint NMM black but layering and washing I can do. Can't wait to see your guys finished! 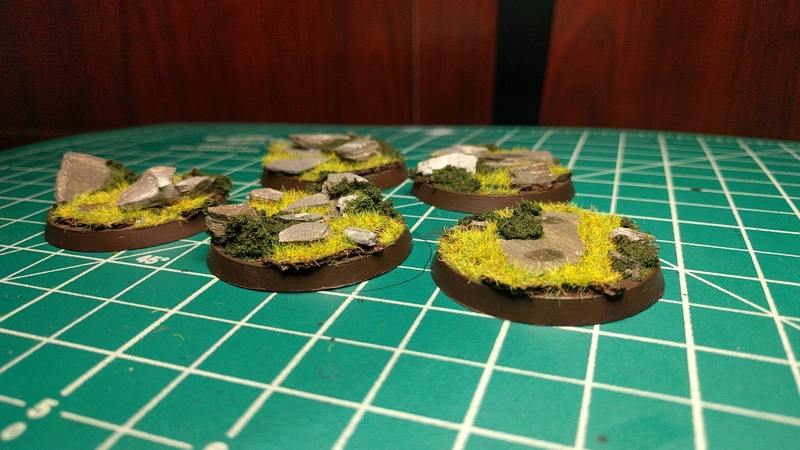 Awesome work man those bases look ACE! 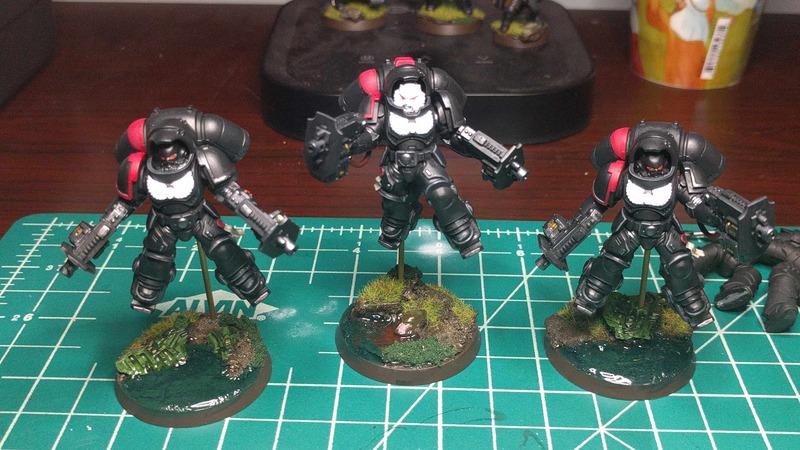 and your inceptors are coming along fantasticly as well definitely looking forward to seeing more. And tonight I can say the Inceptors are 95% done! I have a few details to finish but I'll go back and do those later. I'm still trying to get a decent amount of units painted to TT so I'm ok with that. I did magnetize them in case I ever get my hands on some plasma bits, if not then I have better poses than the stock ones! 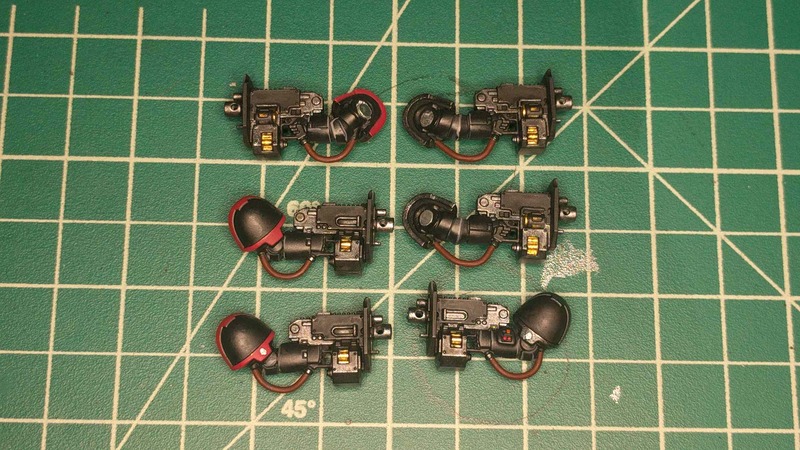 This makes four whole units that I have painted to TT now (10 man tac squad, scout squad, assault squad, inceptors). 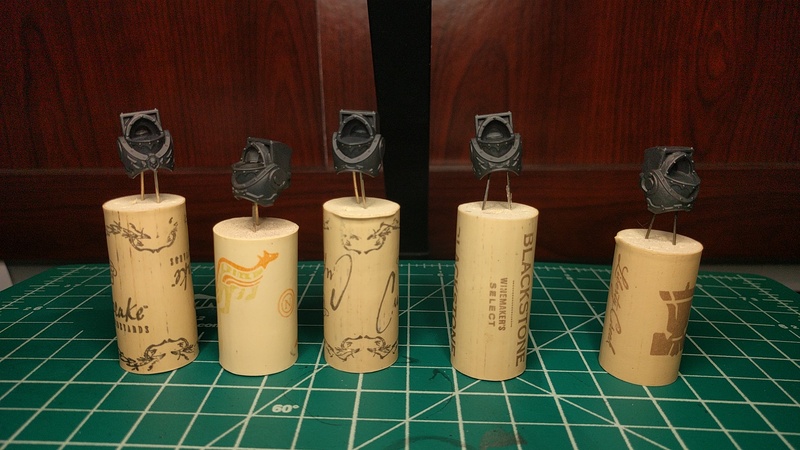 I'm moving on to my cataphractii next, they're currently in the process of having the legs pinned to cork for painting. 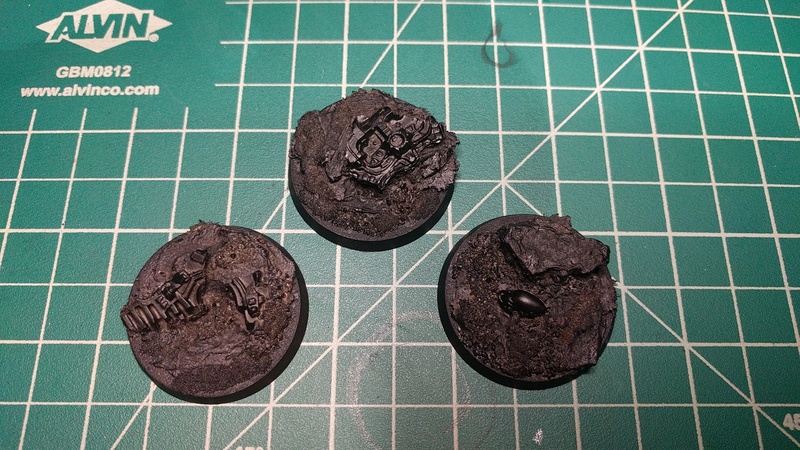 Their bases are already done. Decided to start my cataphractii tonight and then realized I was crazy so I called it quits. 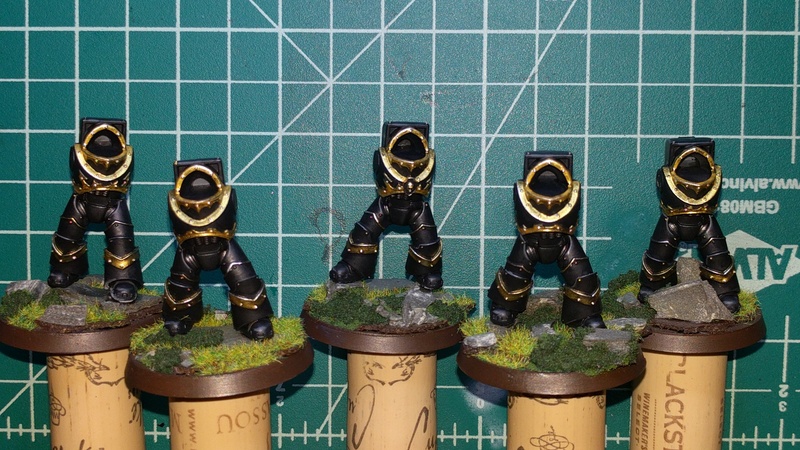 I did get them base coated, and put gold trim on one set of legs. 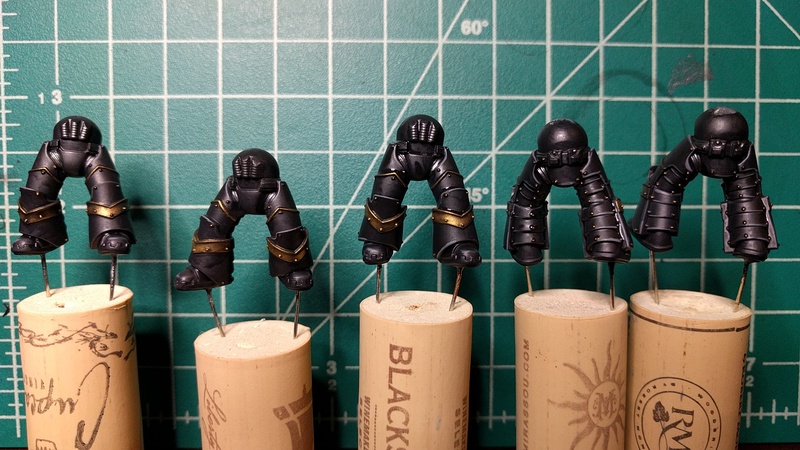 It was at that time I realized I was out of time, the gold on all of the armor studs takes time so I'll put the brush up and work on these later this week. 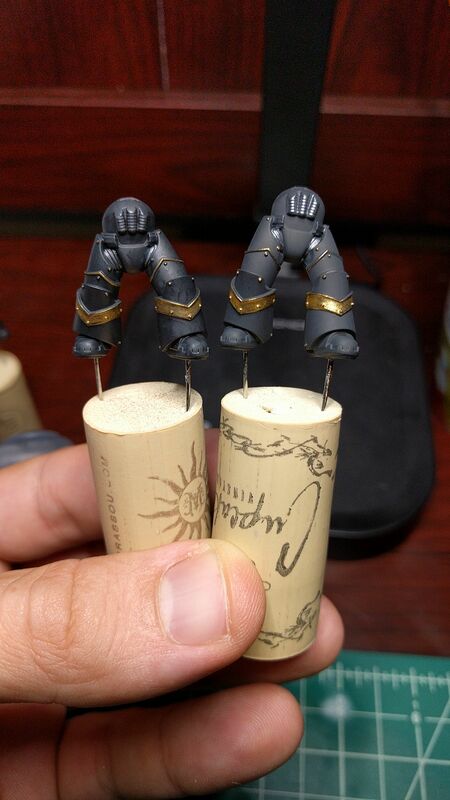 More work on the Cataphractii legs. 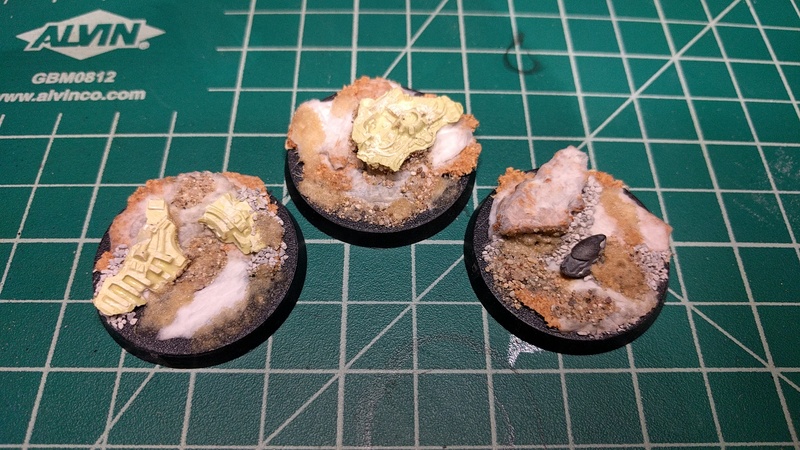 Bases are done and I have the first wash on. 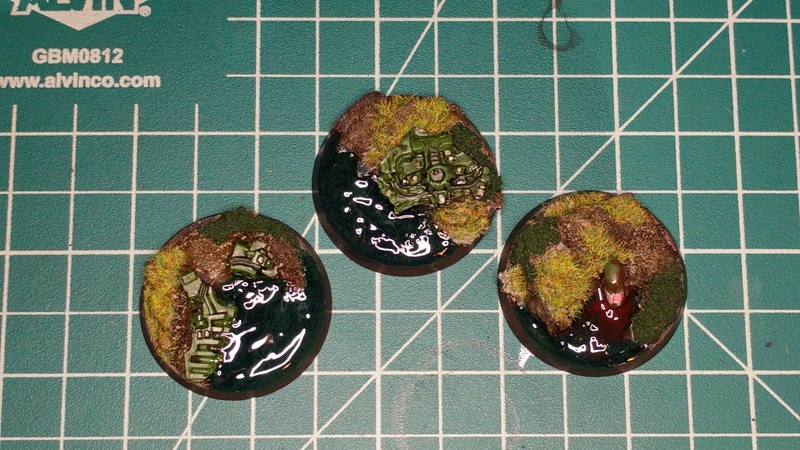 I'll edge highlight and add another wash and then these will be done. The bases are already done so I'll be able to attach them and start playing with them using sticky tack to hold the torsos on. 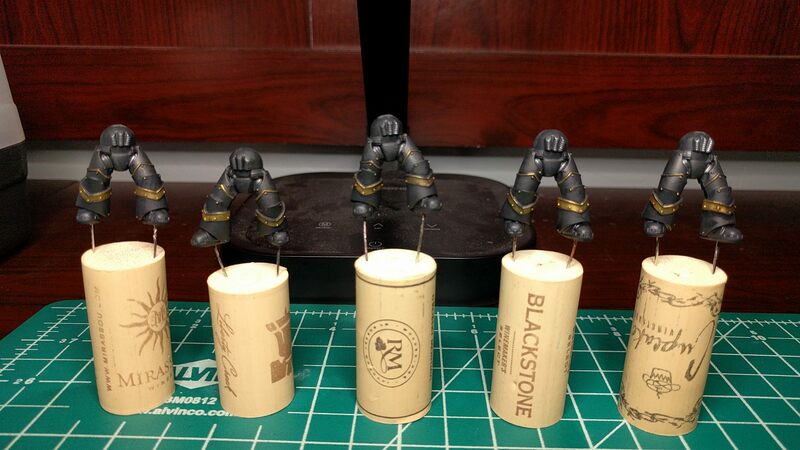 The arms are magnetized already so it'll make using them easier while they are still in WIP stage. Got the armor highlights and second wash done. 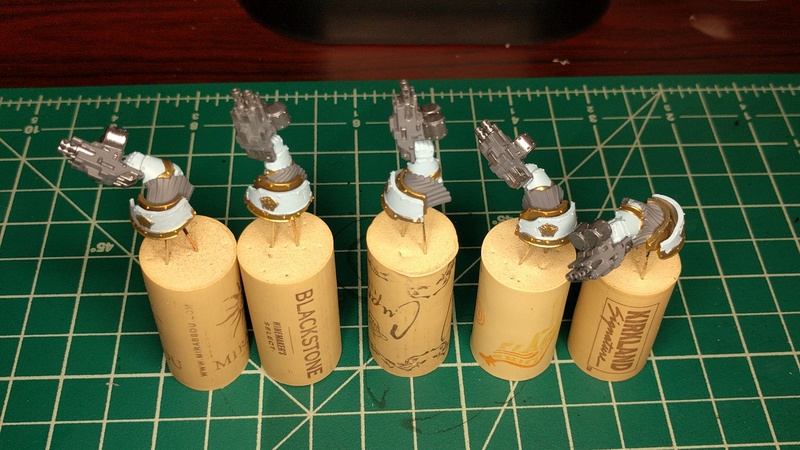 One final highlight of the gold and studs tomorrow and these legs will go on bases. (The wash is still a bit wet in some spots in the pic). 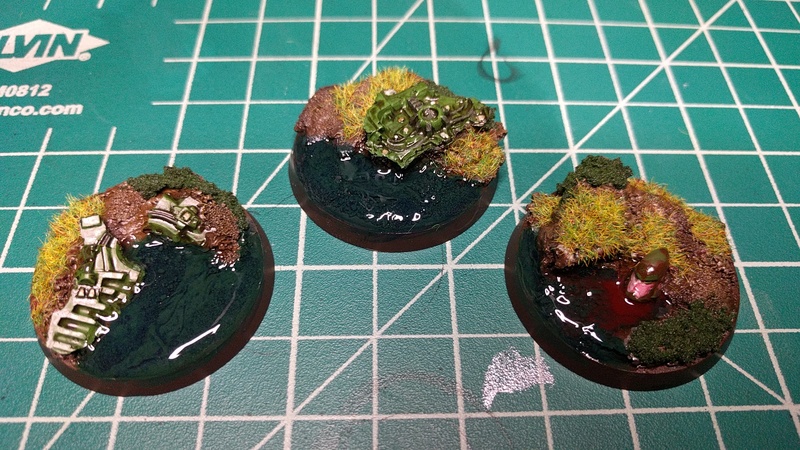 Finished the 40mm bases. 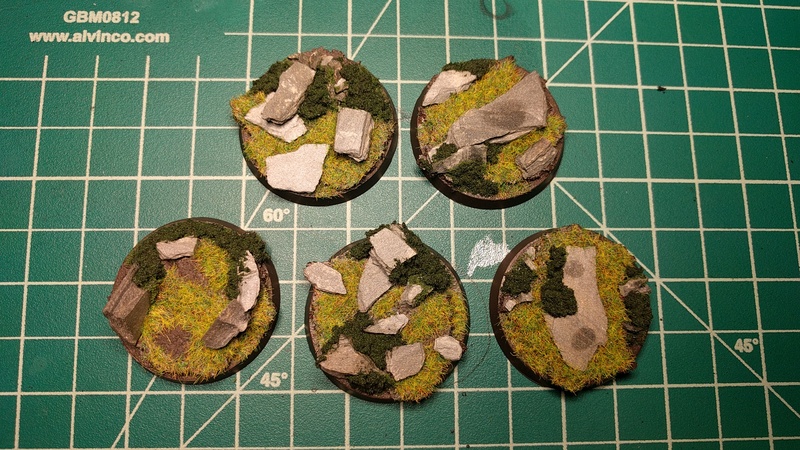 These were some of the first 'Baran' themed bases I made and I've improved a lot on them since I started. 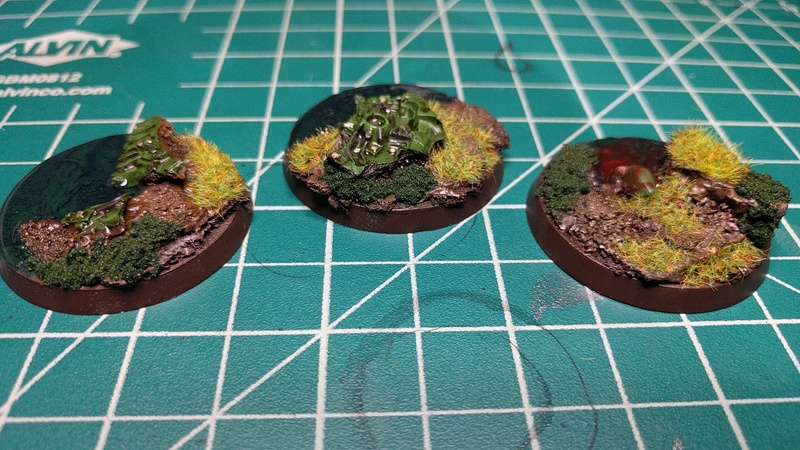 They felt really bland to me and 'flat' so I added some green foliage to the bases and I really like what the little touch did. 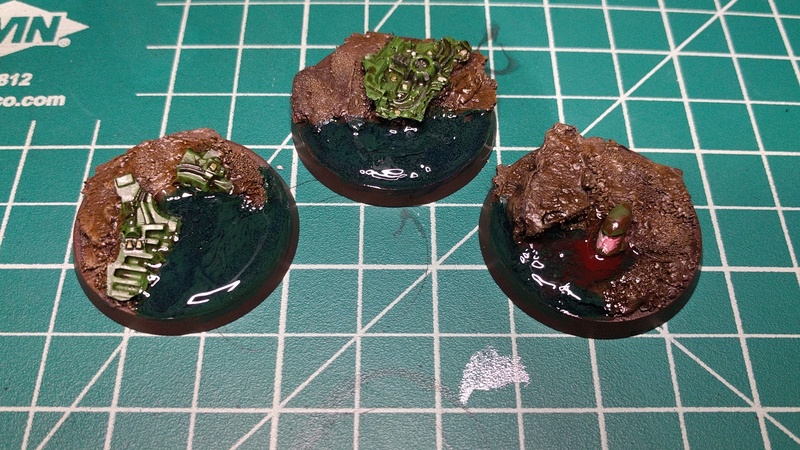 The 'wet' stains are form when I sticky-taced guys on the bases to use them in a game. Those will be covered up when I attach the legs so I'm not worried. 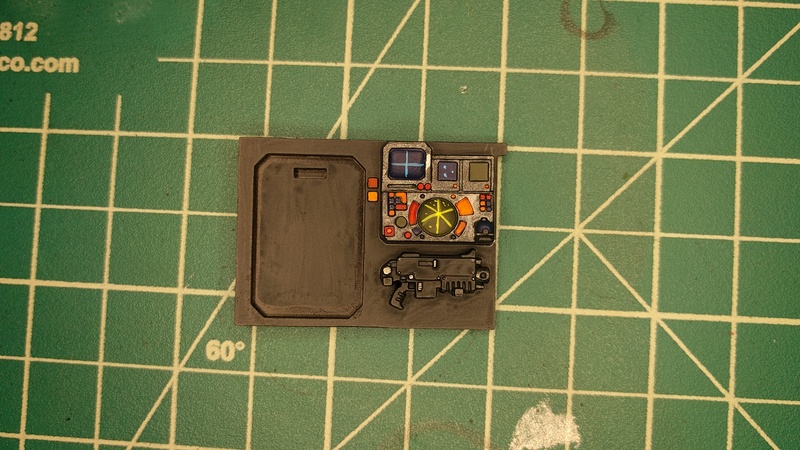 I also painted the control panel for the inside of my rhino/razorback chassis. The radar is my first bit of any type of free hand, it could have been better. I also wanted to use the panel to practice painting black since it was a large flat piece. I've held off painting the rest of the model because I don't know how to make the black look good with brushes. Washes tend to pool and splotch, I really don't want it to be a flat color with highlights so I'm really not sure what the best way to paint it is going to be. Any tips or tutorials on painting it would be appreciated. The black armour and gold detailing are looking really nice, as are the details on the control panel. I love the depth you've achieved on the black, it really brings it to life. Great stuff! Thanks for the compliment. 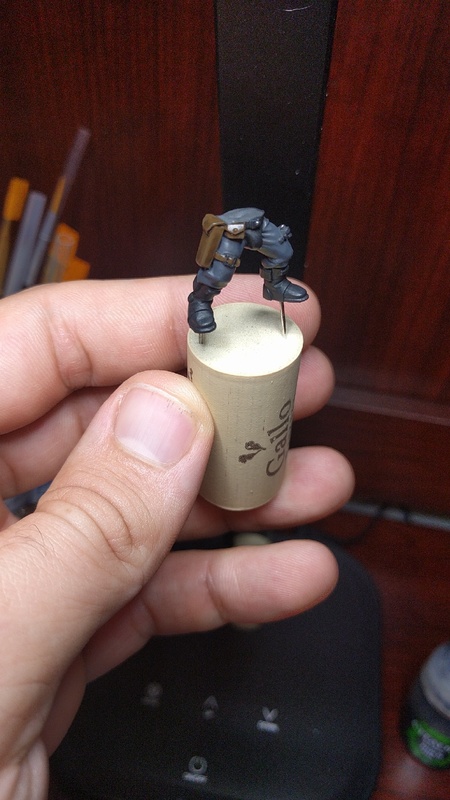 Basing in a dark grey and washing with Nuln Oil is easy and gets me there. It usually takes around three layers of wash but I feel it's worth it. Black can be boring and flat or rich and deep. The Painting Buddha guy did a great video on Horus with his black armor. What I'm struggling with right now is how to paint vehicles with only brushes and not having them be flat and boring since washes pool up and I don't have the patience to apply 100 layers of feather-painting technique per area of shading/lighting. 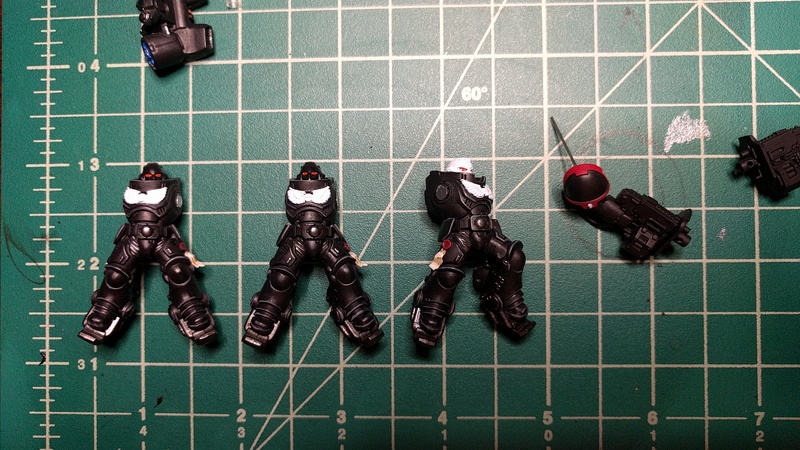 Got most of the torsos complete last night. I will was the steel and apply the brighter gold on the trip and these will be done. They painted up really easily and I am loving the black/gold trim. 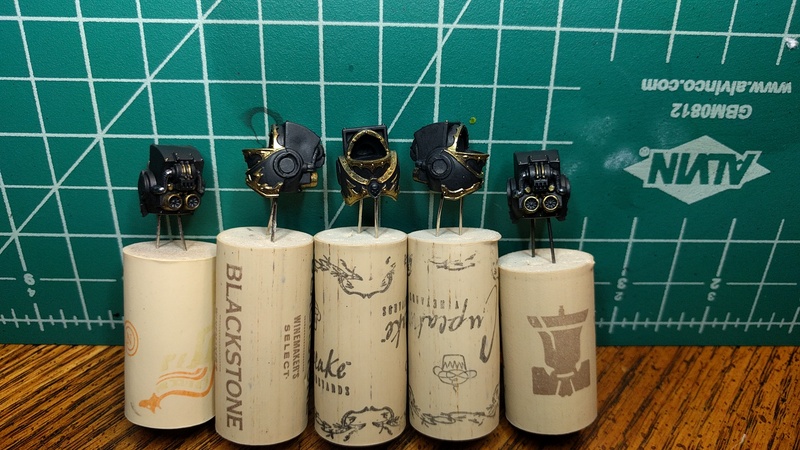 I think once I get the arms done the white/gold contrasting the black/gold is going to be awesome. 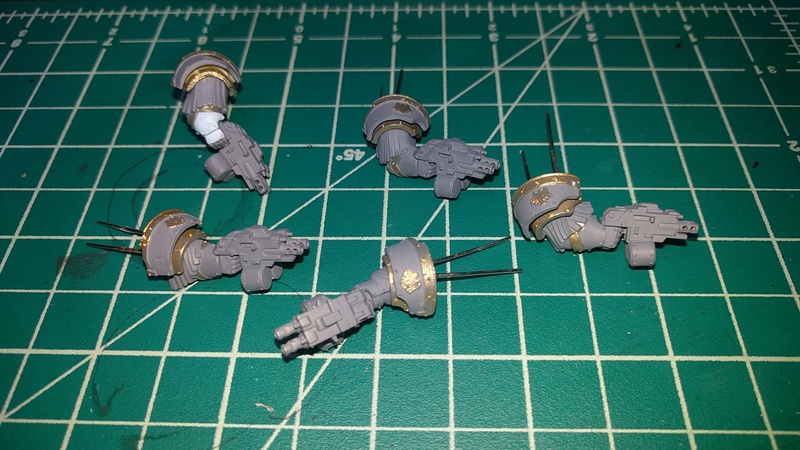 I also finished priming the bits for them as well. I'm not sure what color I want to paint the leather. I could do a brown like I did on my scouts but I feel like that's the easy way out. I thought painting the leather the color of the company they were promoted from might be kind of neat. Some red, a purple, a blue, etc... not sure yet. I'm also not sure what do do with the skull on the Sgt torso. Any ideas? I ended up making it gold. I thought white might be too much of a contrast. 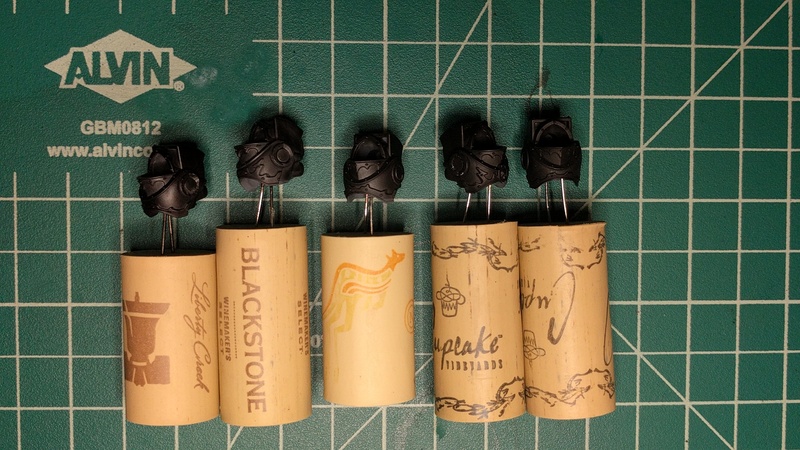 On to heads and those tiny tiny tiny little eye slits, arms, and leather. Still not sure what to do with the leather. I might just go for a brown since I know I can pull that off (did with my scouts' pouches that I'll eventually post up). Loving the models, hating how long they're taking/going to take! Here's a couple quick shots while I wait for paint to dry and give my hands a break. Just swapped out the wet pallet for a clean sheet so I can keep on going. I was thinking that too, mostly because it'll be easy. These arms are killing me right now with the detail/work. And I still have to do the left arms... *sob*. I like the leather I was able to get on the leather for my scouts. I think I may just go with that. It's a simple base layer and then a wash. I plan on putting up some past WIP pics of them but here's this one for now so I can get some feedback. 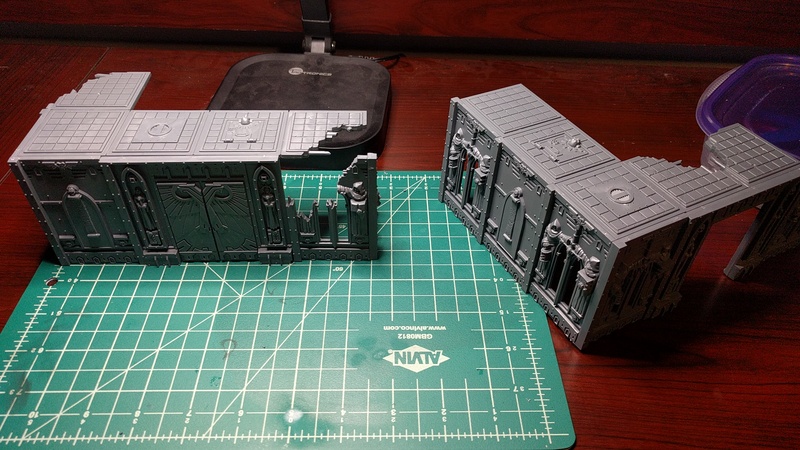 I have zero motivation to paint so I decided to build the terrain that came in my Knights Renegade box. 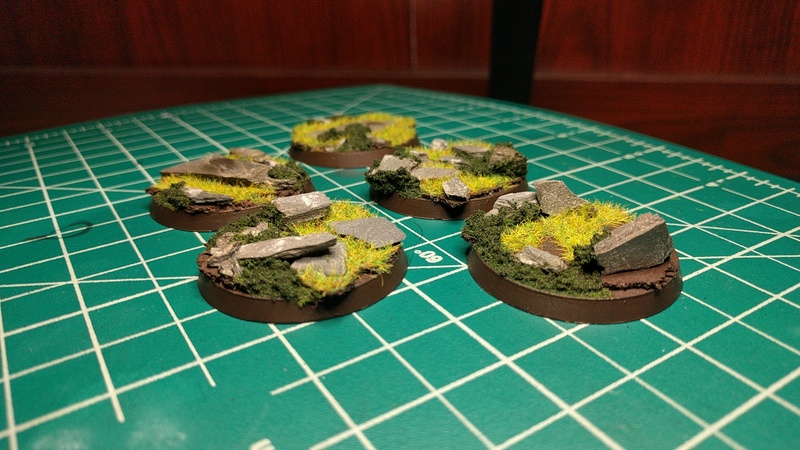 I'm going to keep them separate for now since I have so little terrain but I may eventually combine them into one as I add more terrain to my collection. I'm really looking forward to painting these eventually as well. Lots of detail, but it's all going to be easy to access.